If a good restaurant in Nimes is what you seek, you don’t have to search far. Here’s 3 of our favorites that we’re sure not to miss when we’re in town. This restaurant is run by chef Michel Kayser, owner of 2 Michelin stars. You’ll adore this elegant, yet rustic, restaurant that’s located right outside the city center. The menu consists of classic French cuisine, with hints of chef Kayser’s subtle improvements. You’ll pay a pretty penny per person, about 44€-66€, but when you taste the dishes you’ll know why it’s worth it. We recommend the roasted pigeon breast with fresh seasonal baby vegetables, or the courgette flowers with truffle mousse. You also can’t go wrong with chef Kayser’s version of the popular dish “Brandade de Morue”, which consists of salted, pureed, and poached cod. 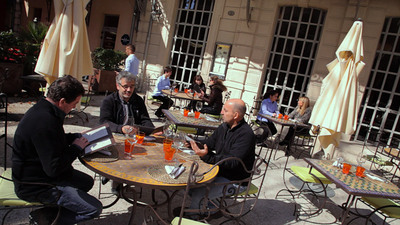 This restaurant is located just outside the Roman ampitheatre, and is run by Michelin starred chef Olivier Douet. There’s a giant covered terrace you can dine under, or a beautiful dining room indoors. There are a lot of restaurants in this area, but this one we’ve singled out as one of our favorites – one of the reasons being their scalloped risotto. You can’t go wrong with the filet of bull on garlic sauce, however. The prices here are medium to high, about 22€-29€ per person. Nestled in the Royal Hotel sits the La Bodeguita restaurant – a Spanish restaurant with a whole lot of flair, and a whole lot of tapas. Located in a great spot right on the place d’Assas, this restaurant attracts people from all over the city who crave some of their famous tapas. Tapas favorites include: octopus salad and Greek meatballs, organic bull steaks, and Nimois brandade de morue. The price is medium to high, but very worth it, at about 22€-34€ per guest. Nimes is a very old and culturally significant city in France. It derives its name from a spring in the Roman village, which was named after Nemausus – a local Celtic god of the Volcrae Arecomici. The history of Nimes dates all the way back to 4,000 BC, where it was a Neolithic site of Serre Paradis. It went survived the Bronze age, the Gallo-Roman period, multiple invasions, and the French revolution. Today, it is a peaceful and historically beautiful city of culture and textile production, including the denim fabric used to make jeans. The Roman Ampitheatre: Built in the 1st or 2nd century AD, this is one of the best preserved Roman arenas in France. It also contains medieval housing within its walls. Today, the ampitheatre is still used to host concerts and bull fighting. The Maison Carree (Square House): This is a small Roman temple that was built in 19 BC, and is one of the best preserved Roman temples in the world. You can even view a short history film of Nimes inside the temple. Pont du Gard – A well preserved aqueduct that at one point was used to carry water across the Gardon river valley. Carre d’Art: A museum conceived by Norman Foster that features modern art. Kisho-Kurikawa: a building built in the shape of a hemicycle to reflect the ampitheatre.